By cleverly unraveling the workings of a natural cosmic lens, astronomers have gained a rare glimpse of the violent assembly of a young galaxy in the early Universe. Their new picture suggests that the galaxy has collided with another, feeding a supermassive black hole and triggering a tremendous burst of star formation. Click on image for details and more graphics. The astronomers used the National Science Foundation's Very Large Array (VLA) radio telescope to look at a galaxy more than 12 billion light-years from Earth, seen as it was when the Universe was only about 15 percent of its current age. Between this galaxy and Earth lies another distant galaxy, so perfectly aligned along the line of sight that its gravity bends the light and radio waves from the farther object into a circle, or "Einstein Ring." This gravitational lens made it possible for the scientists to learn details of the young, distant galaxy that would have been unobtainable otherwise. "Nature provided us with a magnifying glass to peer into the workings of a nascent galaxy, providing an exciting look at the violent, messy process of building galaxies in the early history of the Universe," said Dominik Riechers, who led this project at the Max Planck Institute for Astronomy in Germany and now is a Hubble Fellow at the California Institute of Technology (Caltech). The new picture of the distant galaxy, dubbed PSS J2322+1944, shows a massive reservoir of gas, 16,000 light-years in diameter, that contains the raw material for building new stars. A supermassive black hole is voraciously eating material, and new stars are being born at the rate of nearly 700 Suns per year. By comparison, our Milky Way Galaxy produces the equivalent of about 3-4 Suns per year. The black hole appears to be near the edge, rather than at the center, of the giant gas reservoir, indicating, the astronomers say, that the galaxy has merged with another. "This whole picture, of massive galaxies and supermassive black holes assembling themselves through major galaxy mergers so early in the Universe, is a new paradigm in galaxy formation. This gravitationally lensed system allows us to see this process in unprecedented detail," said Chris Carilli, of the National Radio Astronomy Observatory. In 2003, astronomers studied PSS J2322+1944, finding the Einstein Ring by observing radio waves emitted by molecules of Carbon Monoxide (CO). When astronomers see large amounts of CO gas in a galaxy, they conclude that there also is a large amount of molecular Hydrogen present, and thus a large reservoir of fuel for star formation. In the latest study, scientists painstakingly produced a physical model of the lensing intermediate galaxy. By knowing the mass, structure and orientation of this galaxy, they could then deduce the details of how it bends the light and radio waves from the more-distant galaxy. This allowed them to reconstruct a picture of the distant object. By doing this with multiple VLA images made at different radio frequencies, they were able to measure the motions of the gas in the distant galaxy. "The lensing galaxy was, in effect, part of our telescope. By projecting backward through the lens, we determined the structure and dynamics of the galaxy behind it," said Fabian Walter of the Max-Planck Institute for Astronomy in Germany. PSS J2322+1944 was first discovered by George Djorgovski of Caltech, using the digitized Palomar Observatory Sky Survey. Later radio and optical studies showed that it had a huge reservoir of dust and molecular gas, and indicated gravitational lensing. 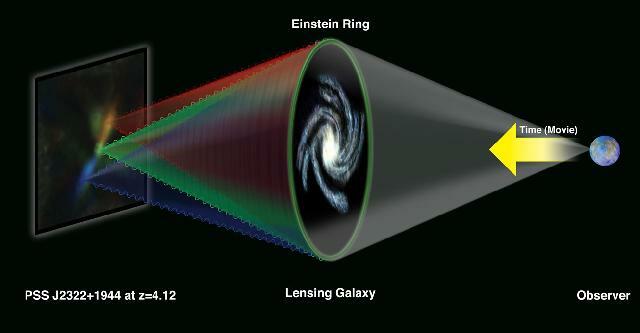 Gravitational lenses were predicted, based on Albert Einstein's General Theory of Relativity, in 1919. Einstein himself showed in 1936 that a perfectly-aligned gravitational lens would produce a circular image, but felt that the chances of actually observing such an object were nearly zero. The first gravitational lens was discovered in 1979, and the first Einstein Ring was discovered by researchers using the VLA in 1987. Riechers, Carilli, and Walter worked with Brendon Brewer and Geraint Lewis of the University of Sydney in Australia, Frank Bertoldi of the University of Bonn in Germany, and Pierre Cox of the Institute of Millimeter Radio Astronomy in France. The scientists reported their findings in the October 20 edition of the Astrophysical Journal.